← Goodbye, Summer. We Hardly Knew You! A little bit of sweetness is okay, but in general, I don’t like my clothing to look too sweet. Details like puffed sleeves, which can do a lot of good for the dimensions of a small skeleton like mine, can easily tip over into juvenile or outdated unless they’re mixed with non-sweet elements. 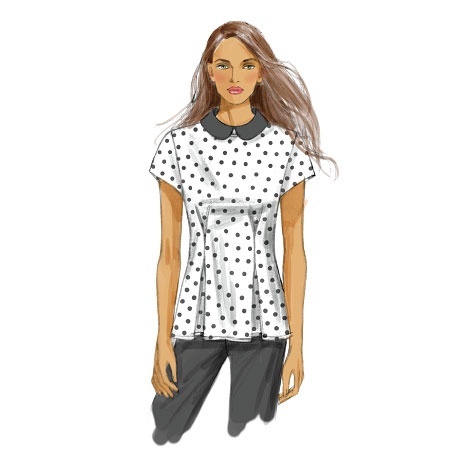 So when I saw Butterick 5890 with the waist tucks and Peter Pan collar, I knew right away I wanted to offset the sweetness of the design details with something a little edgier. My first thought was to make the collar out of leather — and I still have a hankering to do that someday, and the skin to do it tucked away in my stash, so that could happen. I would want to make the collar removable for laundering, and I would probably use some kind of snap tape or hook and eye tape to do that — I’m telling you guys, this could happen someday. I really love the idea of a Peter Pan collar in leather. But for this version, I had some black and silver abstract knit that I thought would work perfectly. 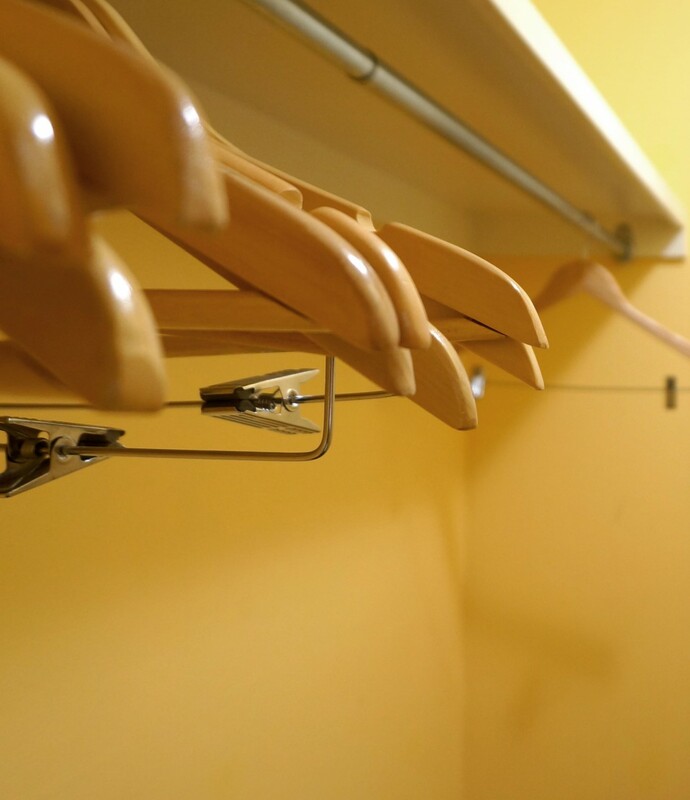 I didn’t bother with an FBA because I figured the room created by the tucks would be sufficient. (Figured in the literal sense, with my tape measure and numbers and some little mathy type work.) The only adjustment I made to the pattern was to shorten it, which was to accommodate the fabric’s yardage. I didn’t have enough to make it any longer, but I think it works okay at this length. Oh, and I used a shorter zipper in the back. 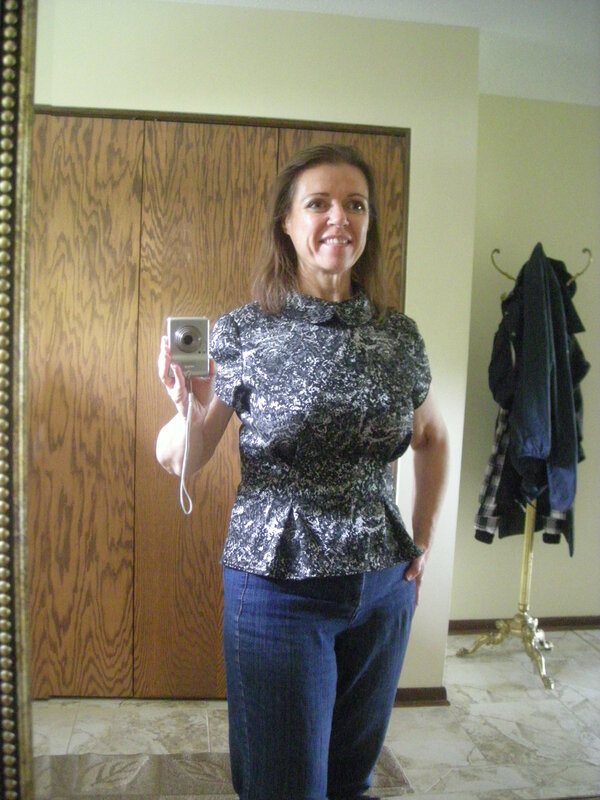 The pattern called for something like a 20″ center back zipper, but I used a 9″ and it worked just fine. In a woven fabric with zero stretch, a longer zipper would be necessary. The fabric was something I bought online from one of the discounters. Many people are huge fans of this particular place and rave online about it, but I’ve had mixed luck with their fabrics. This particular fabric was billed as ponte de roma, but that’s not what it is. A true ponte looks the same on the front side and back side because of the double-knitting technique used to create the fabric. This stuff is knit with two strands (as a ponte would have been), but it’s a regular stranded knit. There’s a definite wrong side to the fabric. The black thread is the main color, and the silver thread is carried along the back and woven in at intervals in much the same method used by Elsa Schiaparelli’s Armenian knitters, just on a machine with thread instead of by hand with yarn. So, not a ponte, and not even a double knit, just a stranded knit. Silly me, expecting people in the business of selling fabric to correctly identify the type of fabric they’re selling. I like this top a lot. It turned out just as I’d hoped, a sweetly feminine shape made modern with an edgier fabric. It was a quick and easy project, and I’m already keeping my eyes open for a fabric that will work with that leather collar I have in mind. Highly recommend the pattern. Sweet + Edgy is one of my style favorite combinations. What’s yours? Thanks, A. I’m recovering well. Today I had both my first shower and my first outing post-surgery. It will take three months to fully recover, but I should be back to a normal schedule within a week. It’s really going well. Good to know you’re all right, Teresa. Have you cut back a bit at work for the next couple of months? Being back to a regular schedule, as you put it, is a tough journey when you’re post-op, no matter how good your intentions are! Thanks, Barbara! Yes, I’m very lucky to have one of those jobs where I control the volume. I was able to dial down the flow on some tasks all the way to zero for now. I’ll keep doing other things because they’re really not difficult and I think I’d go crazy if I didn’t work at all! But the healing really is going well so far, much better than expected.